Update 7-11-07: My editor tells me that ARCs should be in the goody room some time today. I would imagine later in the afternoon. This has been a very exciting couple of days. While I’ve been buried deep under the inscrutabilities of consolidated financial statements and the mysteries of Access databases, all the while trying to keep my hair from spontaneously combusting, Caitlin Alexander, my wonder-editor at Bantam, has totally been on top of things in getting ARCs of my first novel into production. Today I got the covers (front and stepback) for the ARCs Bantam would print for distributing at RWA National. Not only are they such beautiful covers, but these beautiful covers contain very generous blurbs from Mary Balogh and Jane Feather! I’m thrilled to share this day with you. And I hope that very soon I will be able to share in your pleasure and delight as your publishing dreams come true, too. Categories News and AnnouncementsTags Covers, Private Arrangements, Yay! Wow. What a gorgeous cover. What do I have to do to convince someone to let me have one of those ARCs? Woo-woo!! They’re so beautiful! Congratulations! Oh congrats. 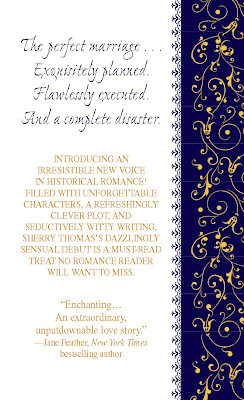 I hear that Mary Balogh is quite reticent when it comes to giving author blurbs, so you go girl! Can’t wait to get a hold of this–particularly since it’s an Edwardian (my favorite time period). Congrats on your covers. That’s sooooooooo cool! Thanks, everyone. I am so very fortunate. Angela, thanks for the tidbit about Mary Balogh. I wasn’t involved in the process at all so it’s reassuring to know that she wasn’t just being nice, as she is a fellow Bantam author. The cover is absolutely exquisite, but the title…meh. I’m sorry it had to change, because I thought Schemes of Love was a very memorable title. Plus, it fit the story quite nicely. LOL, Emily. It’s been Schemes of Love since I first writing in 99. My agent loves the name. Even my editor was fine w/ it. But nobody in marketing wanted anything w/ the word Schemes in it, not Schemes of Love, not Schemes of Desire, what have you. So I was sent a list of proposed titles. My inner prude started fainting at titles like “Sleeping Arrangements” and “Rules of the Bedroom.” I was okay with “Not Quite a Husband.” Then I was okay with “The Perfect Marriage.” But in the end it was what the marketing reps liked that counted. And I said go right ahead, since they are professionals and know their end of the business a lot better than I do. Thanks for the insight…funny how the authors’judgments are trusted for all (most) of the words in the story but not the title. In some ways, it shouldn’t matter so much. Oh well, at least the book is still coming out…yay! Absolutely gorgeous cover. I will be there at Nationals and hopefully get my hand on your ARC so you can sign it on the 14th. Beverley, looking forward to meeting you in Dallas! hmm…actually, I think “schemes” does carry a negative connotation, while “private arrangements” sounds deliciously lascivious. I do a lot of copywriting on the side and I think your marketing people were on the ball here. Best of luck, Sherry. I enjoy your blog immensely and have kept a link up on my blog ever since I started it in March. A fan of the new title, cool! Thanks for sharing your expert opinion, Maria. Lovely covers and author blurbs. For what it’s worth, I like the new title, too. It’s a beautiful cover and I love the new title. Congrats! And I love the new title. When, when, when will we have it in our hot little hands? The street date is March 25, 2008. But there will be hundreds of ARCs floating around RWA Dallas. If you or anyone you know is going, have them grab a copy for you. Wow, that is an absolutely gorgeous cover!! Congratulations on the breathless blurbs. I can’t wait to read it! Hey Sherry — Congrats on the cool cover and the 100 (!) ARCs for National. The excerpt on your website is wonderful, consider me another hooked fan. Came here in a round-a-bout way – but that is one GORGEOUS cover and very squeee-worthy! And I think it’s good title too. Lenora, fascinating story you have. Jude, I’ll see if I can save a copy for you. Hi, Sherry. You won my contest! PM me with your mailing address and I’ll put the prize in the mail. Thanks, Chris. I’m so glad you liked it. Sherry's greatest happiness as a writer is that her mother does not read books. Ah, the sweet freedom. About Meredith About Sherry Agents Audio Books Awards Bettie Sharpe Book Proposals Book Tour Book Trailer Bound by Your Touch Contests Covers Craft CrocoDesigns Delicious Elsewhere Sherry Fangirl Squeal food Foreign Covers Funneh Giveaways Gratitude Handmade Beauty Products His at Night Interview Not Quite a Husband Not So Philosophical Musings NWFP On Romance Philosophical Musings Private Arrangements Publicity Publishing Queries Rant Recipes RITAs Romance Heroines RWA Nationals SF Romance Sherry Gets Lucky The Writing Life Wicked Becomes You Written on Your Skin Yay! "Duran fulfills readers; needs for romantic stories,original characters, and delightful plotlines. There's so much fun tobe had in her latest tale featuring a good girl who wants to be bad and the bad boy who wants her; it's charming and deliciously sensual from beginning to end." —Romantic Times TOP PICK! A CONSPIRACY IN BELGRAVIA is available! Sherry Thomas on A CONSPIRACY IN BELGRAVIA is available!